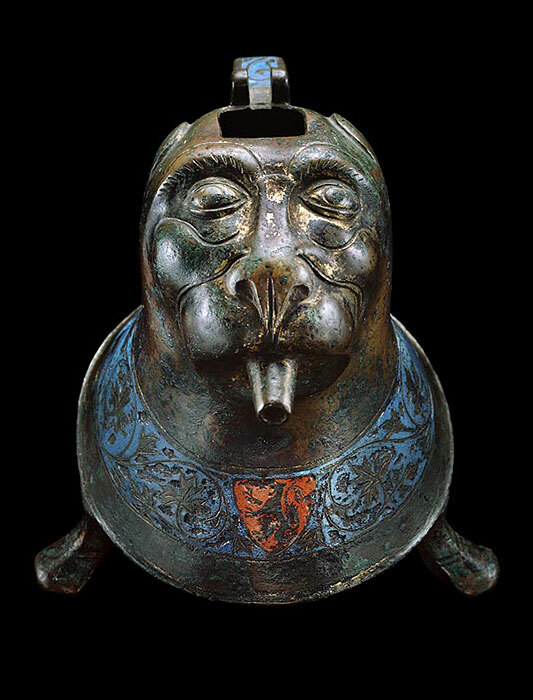 Aquamanilia, or water ewers, developed as a special type of vessel during the Middle Ages. 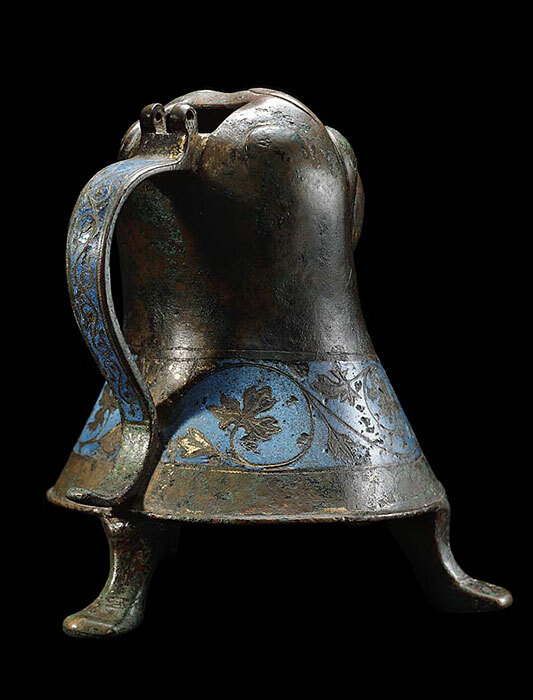 Early examples were fashioned of terracotta, but by the twelfth century, metal versions came into fashion. Despite their utilitarian function of pouring water with which to wash the hands between courses during meals (which were eaten with the hands during this era), great care was lavished on their creation. Various animal motifs – both natural and fantastic – were popular. The vessel is bell-shaped with a waisted body and flaring, flat base rising on three outward curving legs. An S-shaped handle is welded to the top and bottom and it originally held a small hinged lid to cover the square opening at the top. 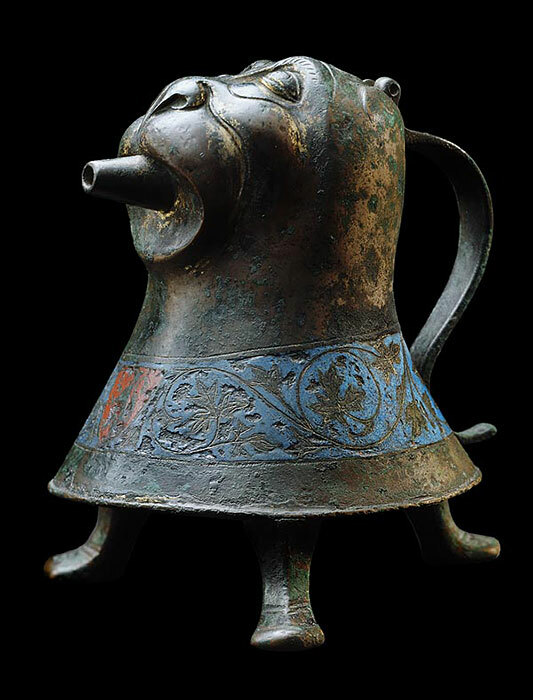 The upper portion of the front of the ewer was beaten into the shape of a stylized head of a lion, a common subject for such objects. However, other leonine ewers utilize the entire animal, with the body serving as the vessel, the animal’s legs as the supports, and the arched tail as handle. This one is unique in its form of a disembodied lion’s head grafted to a non-corporeal chamber. The beast’s eyes, wide and surmounted by incised parallel lines that represent eyebrows, gaze heavenward. The various convex volumes of his face are accentuated by decorative linear incisions. A short conical spout emerges from his open mouth. Decoration, carried out in champlevé enamel, occurs in two bands – one around the base of the vessel and one on the outer surface of the handle. The basal band is a foliate garland set against the blue enamel with a central shield, depicting a rampant lion, in profile facing left, within a red triangular shield device. Additional floral motifs, within a blue strip, run down the handle. The traces of gold indicate that the aquamanile was covered in gold all over, except on the enameled zones. Swarenzki, who published this ewer in 1949, identified the lion within the central shield as a heraldic motif associated with noble Guelf families of Brunswick or Luneberg in Saxony.